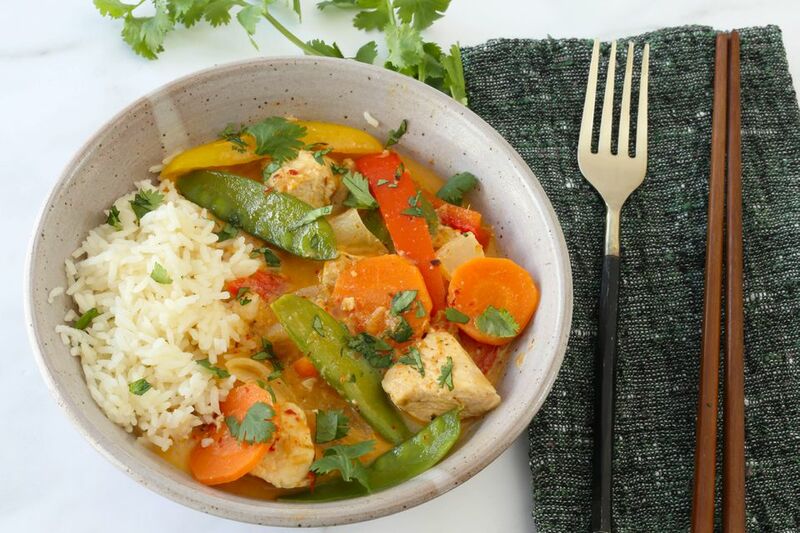 With help from the Instant Pot pressure cooker, this Thai chicken curry couldn't be easier! With red curry paste, coconut milk, and fresh vegetables, it is bound to be added to the menu rotation. There are many brands of red curry paste on the market, and some are spicier than others. If you are unsure of the heat, begin with 2 tablespoons. You can always add more along with the vegetables when you taste the broth. The recipe calls for chicken breasts, but feel free to substitute with boneless chicken thighs and add an extra 2 minutes to the pressure cooking time. Add the chicken stock to the Instant Pot along with the coconut milk, fish sauce, ginger, curry paste, lime juice, and lime zest. Add the chicken pieces to the pot. Turn the steam release vent to the sealing position and choose the pressure cook function, high pressure (manual on early models). Set the time to 5 minutes (7 minutes for boneless chicken thighs cut into chunks). When the time is up, carefully move the steam release vent to the venting position (for other brands, follow your pressure cooker's instructions for a quick release). Cancel the pressure cook function. With a slotted spoon, remove the chicken pieces to a bowl or plate and set aside. To the pot, add the thinly sliced carrots, red and yellow peppers, and snow peas. Choose the sauté function and bring the mixture to a boil. Cook for 3 to 4 minutes, just until the vegetables are crisp-tender. Add the chicken back to the pot and heat through. Cancel the sauté function and ladle the chicken curry into a serving bowl; garnish with cilantro. Serve the curry with hot cooked rice. Enjoy! Fish sauce is a salty, savory condiment, and it is a common ingredient in Thai food. If you must substitute, use soy sauce, but taste as you add it in small amounts. Jazz your curry up with different garnishes. Some excellent options include fresh thinly sliced makrut lime leaves, sliced fresh pepper rings, Thai basil or sweet basil, chopped peanuts, sliced scallions, lime wedges, and bean sprouts. For a sweeter curry, add a tablespoon or two of brown sugar. Add 1 8-ounce can (drained) of bamboo shoots along with the pea pods and peppers. Instant Pot Orange Chicken Is Instant Flavor! Instant Pot Coq au Vin Means French Food, Fast! Succulent Pressure Cooker Pulled Pork in a Fraction of the Time!